Our superior technology, reliability and customer service have made us number one. ISO 9001 certified and ROHS compliant, KRIËGER designs and manufactures the most technologically advanced solar products on the market today. Committed to continuously offering the most innovative, efficient, and environmentally responsible equipment, KRIËGER invests significant resources in ongoing research and development. By pioneering new technologies and continuously refining our existing products, KRIËGER sets the standards in today’s solar power industry. Our meticulous attention to detail and rigorous standards guarantee the exceptional reliability that our clients have come to expect from KRIËGER. Thanks to exceptional efficiency, a global client base, and an experienced and talented team, KRIËGER is able to offer its exceptional solar energy solutions at competitive prices. Our customers keep coming back, knowing that they are getting the most efficient and reliable products at a fair price. 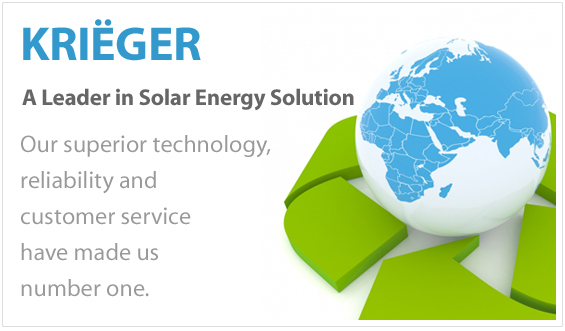 KRIËGER provides each of its clients with exceptional customer service and a complete range of products to meet all of their solar power needs. Our goal is to make every customer relationship a long-term one. Our large volume of repeat customers and steady referrals attest to our success. 2016 Corporate Drive Wilmington, NC 28405 U.S.A. Copyright © 2019 KRIËGER. All rights reserved.